A small bronze plaque with Venus (Greek Aphrodite), the goddess of love, standing to the centre looking into a mirror held in her left hand, enigmatic Greek text to either side, presumably a magical amulet with fixing hole to the top. 2.9 grams, 30mm (1 1/4"). Fine condition. Rare. Property of a London gentleman; acquired London art market, 1970-1980. 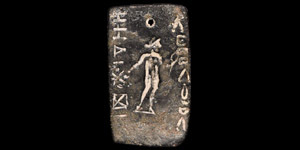 Aphrodite was very popular subject on magical gems, often used as amulets to obtain or avoid love, more commonly carved in stone unlike this object which was apparently intended for fixation to something by the use of a nail.